If you'd like to some light farming, I have an excellent farming spot for you! 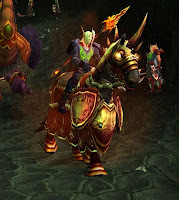 You will be farming large quantities of mobs that drop boatloads of Netherweave cloth and Arcane Tomes. The loot sells very fast, meaning you can farm for hours if you'd like, and never have to wait too long for loot to sell. And that's not all, there's no need to wait for respawns! By the time you're finished, more have spawned. To clear them once more or not? 6 minutes here made me 319 gold. How much can you make in a hour here? This gold making tip is very simple. All you have to do is go to The Path of Conquest in Shadowmoon Valley, Outland. 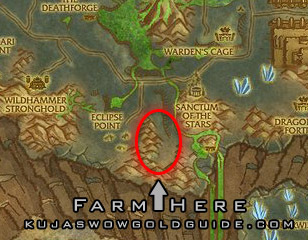 Path of Conquest is found between Eclipse point and Sanctum of the Stars, not too far away from the Dragonmaw dailies. All mobs here are clustered! This area is quite large, and filled with level 70 Eclipsion blood elves. It takes about 4-10 minutes to kill them all, depending on your play style and level. By the time you have killed them all, more have respawned and you can start from the beginning again. With AOE looting this place is a paradise for any gold farmer! Keep in mind that cross realm zones may give you competition, although only people you will see killing these mobs is people questing in the area, or if you're unlucky, someone who has read this gold tip too! After this I turned the netherweave cloth into Netherweave Bags with tailoring and disenchanted the greenies with enchanting. 139 Netherweave Cloth equals 6 Netherweave Bags. These sell very fast always, as they are the cheapest to make and have 16 slots too. This means it's very efficient to farm here even for hours. Only Scryer reputation items take longer to sell, but the bigger the stack goes, the more interested someone will be in buying them. In the end I made 318 gold from the 6 minutes I spent there. You may make double, or only half of it. In any case, not too shabby and beats dailies by miles imo!